QMD: A major general contractor in Quebec, QMD manages large-scale construction, renovation and development projects in Montreal, Quebec City and Toronto. Since the fall of 2017, this exceptional firm has entrusted CDC with the management of its communication tools, including the complete redesign of its website, which will be launched this summer. More to come on this topic! Académie Sainte-Thérèse: For the past three years, this major player in the Laurentian academic landscape has called on CDC to manage its open house campaign and to support them in their communication activities. This year, they entrusted us with the complete redesign of their promotional campaign as well as the creation of their new website scheduled for the start of the 2018 school year. 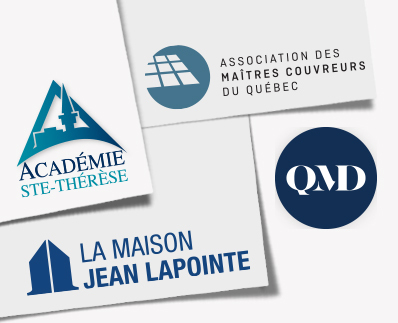 Association des Maîtres Couvreurs du Québec (AMCQ): The Association des Maîtres Couvreurs du Québec has been representing roofing experts in the construction industry in Quebec since 1966. The AMCQ mandated CDC to develop its new communication strategy aimed at introducing the general public to the various facets of the roofing profession. This project includes strategic consulting, project management and the design of various digital and printed tools. Maison Jean Lapointe: With almost 30 years of experience, Maison Jean Lapointe is a major non-profit corporation in Quebec. It supports alcoholics, drug addicts and pathological gamblers in their withdrawal and rehabilitation processes. For 2018, Maison Jean Lapointe called on CDC's expertise to promote the launch of an awareness program for businesses. CDC is proud to be involved in this effort with an organization whose cause we support.